In the fall of 1834, Jeremiah Arnold wandered into what is now the Fairgrounds and pitched camp. He erected a log cabin and settled in for the winter. Jeremiah was of a roving nature, so when approached by New York land speculators he readily sold his tract. Due to legal issues, the "Hillsdale Company" eventually abandoned their notion of building a town on the former Arnold property. Joel McCollum, Rockwell Manning, John Potter Cook and Chauncey W. Ferris then purchased the property north of the site and platted the proposed village in the thick woods. This purchase, bounded by Railroad (now Carleton Road), Short and Bacon Streets, plus a half block west of West Street, later became known as the Old Plat of the Village of Hillsdale. Until 2018, this Howell Street store has always house a jewelry business. Above is Albaugh and Son Jewelers and Opticians. Later it was Kiess Jewelers, then Losey Jewelers. E.C. 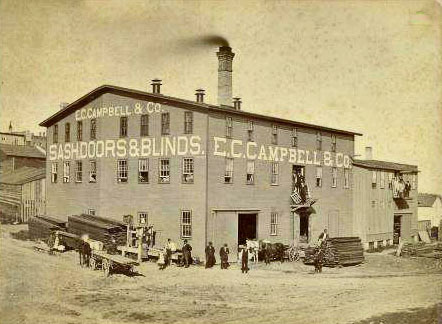 Campbell & Co., formed in 1873 with John Potter Cook as partner, was a thriving business. Cooperage businesses thrived in the early days, which called for someone to haul their wares. W.G. Stone operated a "local and long distance hauling" business from his home on S. Manning Street. Following WW I John MacRitchie Sr. returned to Hillsdale and purchased the Hillsdale Baking Company, located on the site of the former Fredonia Washer Company. This was on Broad Street in the block of stores to the north of St. Anthony's Church. the Walter hume and Elizabeth mitchell Sawyer home next to the mitchell home and later the mitchell Public Library was demolished to build Gray and White Chevrolet. the site later became the hillsdale community library.